1 of 5 Heat oil in a large nonstick skillet over medium-low heat. Add onions; cook, covered, 30 minutes, stirring occasionally. 2 of 5 Heat oven to 425 F. Coat a 15 x 10 x 1-inch jelly roll pan with nonstick cooking spray. 3 of 5 Add garlic, 1/2 teaspoon of the herbes de Provence, salt and pepper to onions. Cook, uncovered, an additional 5 minutes. 4 of 5 On a lightly floured work surfaceroll bread dough into a 15 x 10-inch rectangle. Place on prepared jelly roll pan, pressing out to edges of pan. Spoon onions evenly over the top. 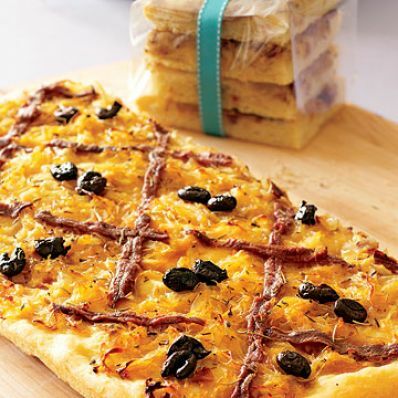 Place anchovy fillets over onions in a lattice pattern and place olives inside the sections of lattice. Sprinkle with remaining 1/2 teaspoon herbes de Provence. 5 of 5 Bake at 425 F for 25 minutes or until lightly browned on bottom. Remove to board, cool slightly and cut into squares. Per Serving: 6 g pro., 206 kcal cal., 603 mg sodium, 3 g fiber, 1 g sat. fat, 4 mg chol., 9 g Fat, total, 27 g carb.